This year was exactly the same. Spotlight’s Best Picture win against the likes of Room, Bridge of Spies, and the clear winner, Mad Max: Fury Road, was polemical at best. It’s not to say that Spotlight is a bad film. But should it be celebrated as an original, provocative, stunning, and game-changing movie? The best of the year? Spotlight revolves around a group of journalists who investigate an accusation that there is child abuse within the Catholic Church and the powers at be covered it up, sending the perpetrators to different churches for the whole cycle to start again. When the numbers and the stories start mounting up, the journalists realise that the issue may be nationwide. Hell, maybe even worldwide. However, the minute they wish to go public with their little discover, the more problems they face – going against one of the biggest corporations in America – religion. Directed and written by Tom McCarthy, Spotlight was indeed a quietly dramatic and brooding film that uncovered the lies and the depth the Church went to protect its reputation. Stirred by the determination of the reporters and the courage of the survivors who need the truth out there, Spotlight agonises with this journalistic journey and powerfully hits the audience. 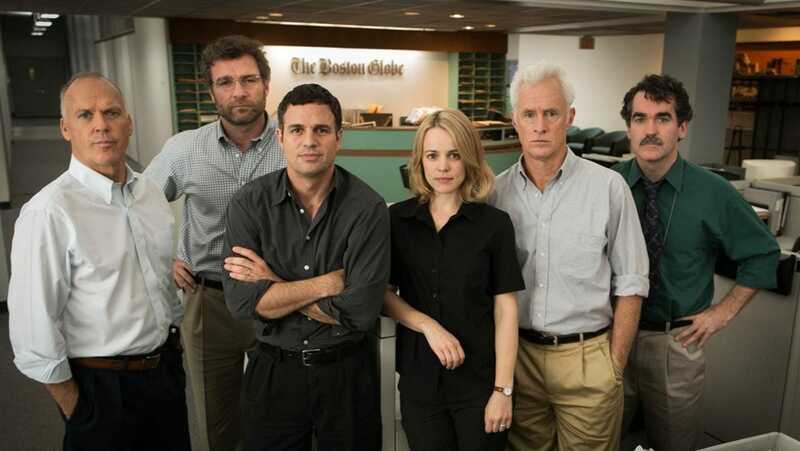 Led by stellar acting Mark Ruffalo, Michael Keaton, and Rachel McAdams, Spotlight thrills with its intellectual exploration of finding the shocking truth of the story. The biggest problem with Spotlight is the safety of it all. By no means is this Best Original Script worthy of the mantel. For a start, it is actually based off a true story and Pulitzer Prize winning journalist report. And seconding, not one iota of the film is fleshed out with a unique flare. As great as the acting and triumphant as the film is, the echo of All the President’s Men and any movie focused on journalism rung throughout the entirety of Spotlight. Comparatively to Ex Machina and Inside Out, McCarthy’s work never fleshes out beyond then narrative and becomes quite dull and garishly so. To be fair to the drama, the quiet work led by impassioned performances does make it a powerful and provocative movie and has one of the best scores of the year, eloquently written by Howard Shore. The greatness comes from this shocking and true story that is captured highly well by all involved. The film hits your discomfort and shocks you with the idea that a child’s safety is second to the reputation of priests and the Church. In fact, the worst ideal here is that folks you thought you trusted – teachers, vicars, police, and authorities – allowed children to get abused and hide it. As indignant as I can get that Spotlight scooped up the best picture, I should be more vehemently mad that generations of children have had their innocence, trust, and lives taken from them. That is what we should all be angry about. SPOTLIGHT IS OUT ON DVD AND BLU-RAY NOW! Now You See Me 2 – Brand New Trailer! It does seem like there are a lot of sequels and reboots out there. Yawn. It’s as though Hollywood has run out of ideas and is piggy-backing off ideas they’ve already made successful. There is a magical fountain of original ideas that Hollywood to pool ideas from but it’s like they have no faith in unique ideas and new writers that they have tokeep churning our sequels like this. Exactly one year after outing the BFI, The Four Horseman are back as special illusionists (except Isla Fisher has been replaced by Lizzy Caplan, which is a cracking!) After exposing the unethical practices of a tech magnate, they are threatened by a tech prodigy, they are pushed into their most difficult heist yet! Now You See Me 2 looks kind of fun and exhilarating like the prior film and has a fantastic cast at the centre of it. It may not be a completely necessary film but could be some mindless magic. Mental illness in film is a really hard thing to depict because every single experience is different, there is still large stigma around it, and it is hard to equate someone’s suffering when you haven’t suffered something similar. Many of the more successful movies intricately weave their own backstory in order to provide an insight to people plighted by a mental disease and how they move forward with their struggles. Maya Forbes, in her directorial debut, enthuses her own past with this saccrine yet sensitive film – Infinitely Polar Bear. Infinitely Polar Bear revolves around a family of four whose father Cam is suffering from bipolar disorder. After a manic episode, mother Maggie decides it’s best for them to separate and takes their daughters Amelia and Faith whilst Cam gets rehab. Unfortunately, finances are slim and Maggie decides to enter a business school for eighteen months in order to get qualifications and a better job. Cam is left in charge of Amelia and Maggie in this sweet portrait of living with mental illness whilst trying to raise a family. There isn’t a review of this film that doesn’t start, or at least mention, Mark Ruffalo as one of the greatest actors on the planet. That’s because it’s true. It’s so true that sometimes just looking at his face makes you quake with anger at how bloody brilliant he is (my breast constantly quiver with jealousy.) 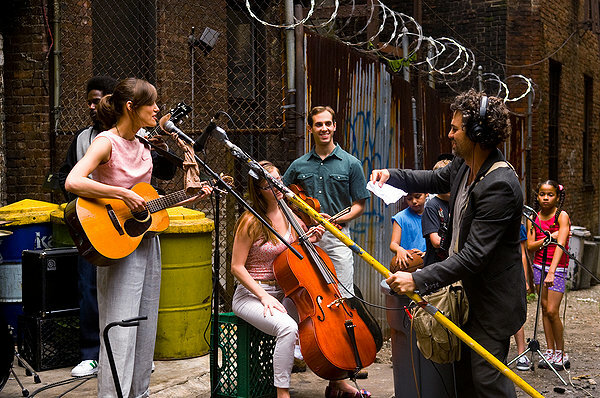 As Dan, Ruffalo is this treasure of a performer whose kinetic energy drives this near pitch-perfect depiction of bipolar. 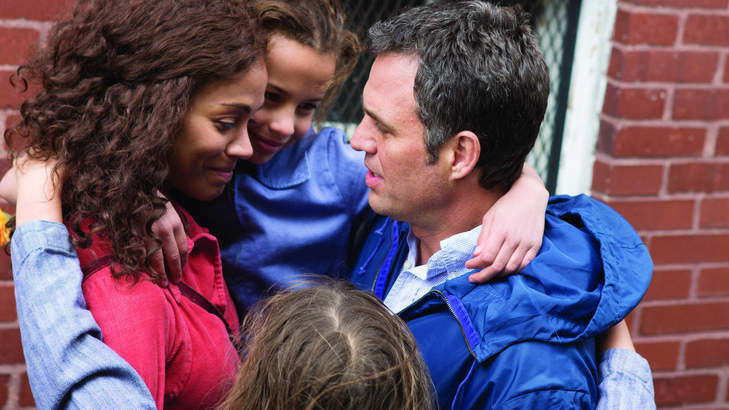 Able to handle the mania with the depression, the normalised states and the extremes, Ruffalo’s nuanced performance is breathtakingly real, poignant, and human. Forbe’s real lie daughter Imogene Wolodarsky and Ashley Aufderheide as daughters Faith and Amelia are treasures despite having no prior acting experience. They are charming, funny, and ferocious, adding innocence and chemistry alongside Ruffalo’s performance. Don’t forget Zoe Salanda who is steadfast as mother Maggie, trying to accumulate stability for her family. Forbes delicate script and story-telling is remarkable, drawing on her own experience with her father to tell the tale. Perhaps using her own history as the backbone for this film elevates it into one of the greatest because it never relies on clichés nor skim over the facts to be an Oscar-bait movie on mental illness. Instead, Forbes takes you into this world where these daughters and this father try to get along despite their differences. The biggest dramatic point is each other’s lack of understanding – the daughters who can’t understand their fathers “eccentricity” and a father who can’t get why things keep falling apart and his daughters hate him. The art of getting it right is depicting both the character’s growth is never assigning blame. Dan is not a heinous father, whittling away their innocence because of his bipolar nor are the children bratty for getting frustrated at their situation. Similarly, Maggie isn’t abhorrent for choosing to educate herself to provide for all of them in the future. Whilst there are tensions and extremities here, Forbes intellectually makes Infinitely Polar Bear a charming exploration of this different family but never scrutinises anyone involved. A tender, sophisticated movie that has a big heart, Forbes has done wonders by introspectively weaving the emotion of her past and enhancing it gloriously for the screen. The aspect of a chaotic family still brimming with unconditional love gifts this movie a poetic weight that is life-affirming, warming, and humorous too. 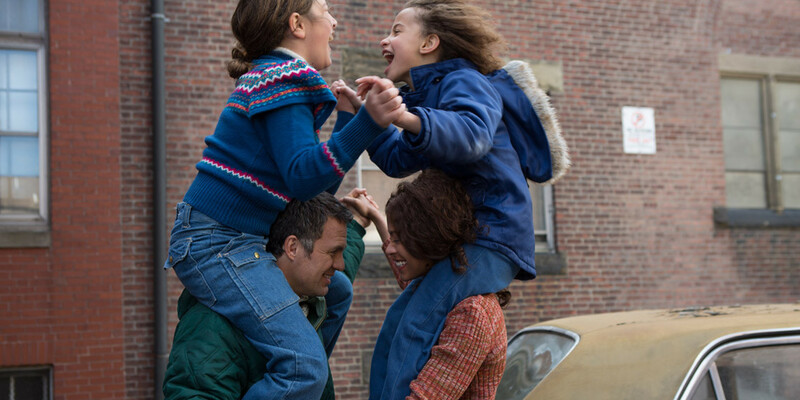 The warmth radiated from this explicitly good family unit, if albeit dysfunctional, allows Infinitely Polar Bear to work without exploiting mental illness. With some impressive, realistic performances, led by Mark Ruffalo, the film is a high-note for Forbes in a glorious directorial debut. Make sure you catch this impressive feature.